Welcome to a new year of English 12. This blog will be the place to find class updates, PDFs of assignments and handouts, and tips for success in English 12. We are beginning the year by looking at several pieces of literature with similar themes. We will spend some time learning techniques and writing formats that I would like you to know for this year. Sometimes what we are doing or discussing will seem “easy” at this stage, and that’s ok – if it’s easy, then it means it’s familiar to you. Just remember a couple of things – this is English class so things like grammar, spelling, punctuation, and legibility ALWAYS count, you will make more work for yourself if you don’t meet deadlines, AND… (and I know this is three things, and that’s more than a couple), ENGLISH is the MOST important class you are taking this year!!! By now you should have your first blog post complete – about winning the lottery. You should also have commented on at least three of your classmates’ blog posts. Next we read The Lottery, by Shirley Jackson. Following this, we learned about response journals, and you should now be working on a polished draft to hand in of your response journal. This is due Friday, September 20th in hard copy form. Just a reminder that the course outline and response journal criteria are available on the “handouts” page above. Next class we will finish the movie and look at a story and poem with similar themes. Don’t forget to renew your library book if you are still reading it – it is now overdue. After finishing some explanatory notes on writing a response journal, we headed to the computer lab to do our first response journal blog post on The Lottery, by Shirley Jackson. Remember that you want to respond to all 4 parts in your response. The notes are also available on the handouts page above. Hyperlinks are a great way to add depth to your response. This can be especially useful in the “connections” section of your response. Link to an informational page or an image, to enhance your response blog post. UPDATE – Your blog posts are NOT due Friday – I will give you more time in class. Today we had a lottery in class! I know… you were all super excited! Greg Z. offered the first bit of foreshadowing when he asked if this was a 6/49 type lottery, or a Hunger Games type lottery – great question Greg! And an awesome lead in to our story “The Lottery,” by Shirley Jackson. We read the story in 4 chunks, stopping to question and think about key lines or words. After we read the story, we had some discussion about why the town holds the “lottery” each year and then we began looking for evidence in the story that foreshadows the dark ending. We all agreed that the story has a “heavy” feel to it – something that Jackson is great at creating – mood, atmosphere (note use of terms from that ridiculously long list of terms I gave you at the beginning of the year). Next class you will complete your first response journal, using this story as a prompt. We had a homework quiz on last day’s review questions then you had the opportunity to discuss all of the questions with classmates in smaller groups. For the second half of the class we went to the computer lab to begin working on our second blog posts for The Crucible. You were assigned 1 quotation each, and then had to choose 4 more from the handout (on the handouts page). You need to write a thoughtful response for each of your 5 quotations. You will have next class to finish this assignment. Some of you are behind with your first blog posts for The Crucible. You have until Friday to post your response journal for Act 1. Last class we took some notes together on the symbolism in the first act of The Crucible. If you were away, be sure to get these notes from a classmate. We then went to the computer lab to begin working on a response journal on Act 1. Your response journal will be posted to your blog. this time I would like to see you take your blog posts to the “next level” by adding hyperlinks or images in your blog posts. This will be especially effective in part 2 where you discuss the connections you made while reading the play. We continued working on our response journals today. Don’t forget that you will need to comment on at least 3 of your classmates’ blog posts. Your comments need to be more significant than “good job” or “I agree.” These comments are encouraged, but you need to follow them up with specific references to their post. You blog posts should be complete for Monday and don’t forget that you also have a quiz on Act 1 on Monday. If you can’t remember the criteria for a response journal you can find it on the Handouts page of this blog. English 12 – This week we watched the film version of Bryce Courtenay’s The Power of One. 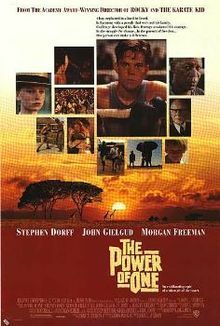 This is a very powerful movie set during the beginnings of Apartheid in South Africa. PK’s journey fits well with the theme we have been focusing on; choosing paths in our lives. On Friday, after finishing the film, you were to do a response journal on the movie. Don’t forget that there are four parts to a response journal – if you can’t remember, there is a copy of the notes on the Handouts page of the blog. The response journal is due on Wednesday, October 12th. If you were absent for part of the film I can show it during lunch in room 1. Please let me know if you would like to take advantage of this opportunity. Wednesday will be your first class with Ms. Campbell. I am very excited about the units you will be doing with her, and I know you will be exemplary students for her during her practicum.